UK's Office of Nationally Competitive Awards will present a Rhodes Scholar information session for UK students from 1-2 p.m. Friday, April 13, in Room 101 of the Stuckert Career Center. LEXINGTON, Ky. (April 9, 2018) — The University of Kentucky Office of Nationally Competitive Awards will host two sessions with Rhodes Scholars Fagan Harris, the assistant American secretary of the Rhodes Trust, and Raymond Burse, former president of Kentucky State University, on the prestigious Rhodes Scholarship. All programming will be presented on Friday, April 13. The day will begin with a coffee and conversation program on the Rhodes Scholarship for faculty running 9-10:15 a.m., in Room 101 at the James W. Stuckert Career Center. This program will be an opportunity to learn more about the Rhodes Scholarship and its connection to Oxford University. The event will also identify ways UK faculty can help recruit more UK students to apply for the award. Those interested in attending this event are asked to RSVP to pat.whitlow@uky.edu to ensure sufficient space and coffee. 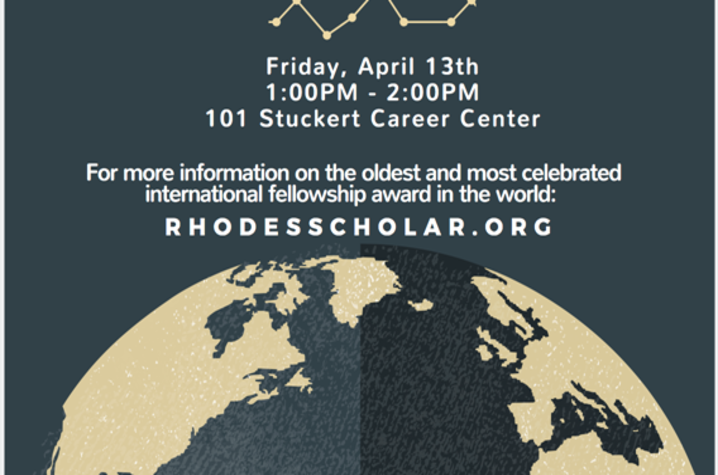 Students can learn more about the Rhodes Scholarship later that same day at a session running 1-2 p.m., in Room 101 at the Stuckert Career Center. The Rhodes Scholarships are the oldest and most celebrated international fellowship awards in the world. Each year 32 young students from the United States are selected as Rhodes Scholars. Rhodes Scholars are chosen not only for outstanding scholarly achievements, but for character, commitment to others and to the common good, and for potential for leadership in their careers. The Rhodes Trust provides full financial support for scholars to pursue a degree or degrees at the University of Oxford in the United Kingdom. The campus deadline for Rhodes Scholarship applicants is Sept. 7, 2018. UK nominees for Rhodes will be selected after an on-campus interview with a committee of faculty members. A previously scheduled session on Baltimore Corps with Fagan Harris for the same day has been canceled. For more information on either of the Rhodes Scholarship programs, contact the UK Office of Nationally Competitive Awards at 859-257-4984 or email pat.whitlow@uky.edu. The UK Office of Nationally Competitive Awards, part of the Chellgren Center for Undergraduate Excellence within the Division of Student and Academic Life at UK, assists current UK undergraduate and graduate students and recent alumni in applying for external scholarships and fellowships funded by sources (such as a nongovernment foundation or government agency) outside the university. These major awards honor exceptional students across the nation. Students who are interested in these opportunities are encouraged to begin work with the office's director, Pat Whitlow, well in advance of the scholarship deadline.